We’ve all dreamt of making a career out of playing poker, but only a select few of us have the skill to pull it off, including fellow Aussie Joe Sachem. Whether or not he is the best poker player in Australia is another question, since the answer can be quite subjective. Some see the best as making the most money, others see it as having the best strategy under their belt and there’s even those that consider losses valuable to a poker player’s repertoire as it can build a sound strategy. We have decided to take a look at Hachem’s poker career and how much he has made from playing poker, as well as take a look at the opportunities being one of the best poker players in Australia has created for him. . Although Hachem was born in Lebanon, he moved to Melbourne, Australia when he was only six so we are obviously going to claim him as our own. From around 1982 to 1995 he worked as a chiropractor but had to retire from this career due to a rare blood disorder which affected his hands and prevented him from being able to work. This meant he had to take some time off and figure out where he would head next in his career. At this time he began to play poker at land-based casinos as well as online. Interestingly, it took 10 years until we really started noticing Hachem, that he claims was mostly due to him losing his temper quite often which affected his gameplay. While it wasn’t until 2005 that we really learnt his name, five years prior he began to play in tournaments at land-based venues in Melbourne, such as the Entertainment Complex as well as the infamous Crown Casino. Here he slowly developed his skills and obviously earned enough money to head overseas for one of the biggest poker tournaments in the world. It’s easy to think of Hachem and think he came from the clouds to win the 2005 World Series of Poker Main Event — that is the biggest tournament in the world. But he had began to garner plenty of respect before this with one player commenting that Hachem would be the best performing Aussie at the tournament. Sachem entered the $10,000 Main Event, which is a no limit Texas Hold’em battle against a few thousand people. While not many knew of his name when the cards were cut, once the tournament was over, he was famous, especially for beating 5618 other players, placing first in the event. This landed him $7.5 million and the title of the first ever Australian to win this tournament. The nine day event saw Hachem as the only Australian in the top 10, or the top 50 for that matter, with the next and only other Aussie, Sarah Bilney placing 63rd. The final day saw Hachem as a short stack but was able to come out on top with only four players left with his hand beating nines from Aaron Kanter, of the US. He took first place against Steve Dannenmann, another US player, winning against a straight. While some attributed Hachem’s win to a fluke, he has actually proven it wasn’t since the win, gaining many titles and places since. In 2006, Hachem was back for the WSOP again and placed 2nd in a short-handed no limit Texas Hold’em event with a buy-in of $2,500. He played against 1068 other players with only one other player beating him, though he was visibly quite disappointed in himself even though he still placed and landed $256,800. At the same tournament he also placed fourth in the pot limit Texas Hold’em pot limit tournament with a buy in of $2,500 against 562 other players. However, when he returned to the tournament he won the year before, placed 238th, and doubts about his skill levels were raised. However, that same year he refuted these claims by winning another honourable poker title. For those of you poker newbies who don’t know what the World Poker Tour (WPT) is it is a number of international tournaments involving poker and the final of each tournament is actually broadcast on television. Hachem won the WPT title in 2006 scoring a nice $2.2 million, bringing his total up to almost $10 million. This title along with his is 2005 WSOP Main Event title makes him one of five people in the whole world who have won both a Main Event title in the WSOP and a WPT title, not to mention the only Australian to have done so. These two titles alone have created a large following for Hachem, opening many doors for the poker player in Australia and around the world. Making millions off playing poker seems like a dream but Hachem is one of the few to do so. Since winning the two titles, Hachem has won a series of other poker tournaments including one which was broadcast on the NBC’s Poker After Dark, known as the World Series of Poker Champions II tournament, only furthering his poker fan base. It featured other main event winners from the WSOP such as Greg Raymer (Hachem’s close friend), Doyle Brunson, Huck Seed, Jamie Gold, and Johnny Chan, whom he defeated. He has also participated in a number of other live tournaments and continued to partake in the WSOP though he has never defended his title from 2005. To only add to his poker status, Hachem produced and hosted an Australian reality television show, which sees Hachem searching for the next talented poker player, known as The Poker Star, in 2009. This madw him quite popular in Australia, not that he wasn’t already before since he has been the only Aussie to win a WSOP Main Event title thus far, making poker quite a popular game here since then. As of June 2014, Hachem has amounted over $11,891,221 in winnings just for playing in live tournaments and on the Hendon Mob he is ranked number one in Australia in terms of earnings, which does make Hachem the biggest winner in Australia for live poker tournaments, but whether or not you think he is the best based on how much he has won is up to you. 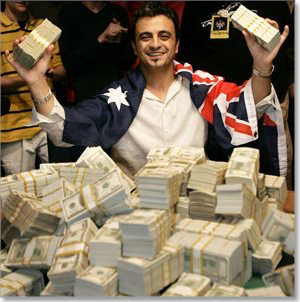 Is Joe Hachem the best poker player in Australia? Before we summarise his career and tell you why we think Hachem is the best poker play in Australia we want to take a look at his poker technique. Hachem realised his temper was a downfall in his gameplay early on in his career, which meant he was able to get it under control before rising to fame and thus has been able to play smartly. He has stated in many interviews that he was so successful in the 2005 WSOP tournament not because it was a fluke but because he made difficult decisions and laydowns quickly. Interestingly, he isn’t a bluffer and advises beginners against doing so. He does claim to have a poker face however and says it is a good idea to keep the same one for each hand regardless of what you may have. The best technique he uses when under intense situations is to focus on his breathing, as it can be a giveaway to what you have. Additionally, Hachem feels he plays best when being filmed, taking advantage of other player’s vulnerability and regard for being on camera. Hachem is considered one of the best high stakes poker players in Australia however we think he is downright the best poker player in Australia. He is the only Aussie to win two prestigious titles, and one in five in the world to do so too; he has made over $10 million in live tournaments, and since he plays online as well we can only imagine how much he has raked in; and he has a huge fan base which has allowed him to pursue other avenues outside of the felt.